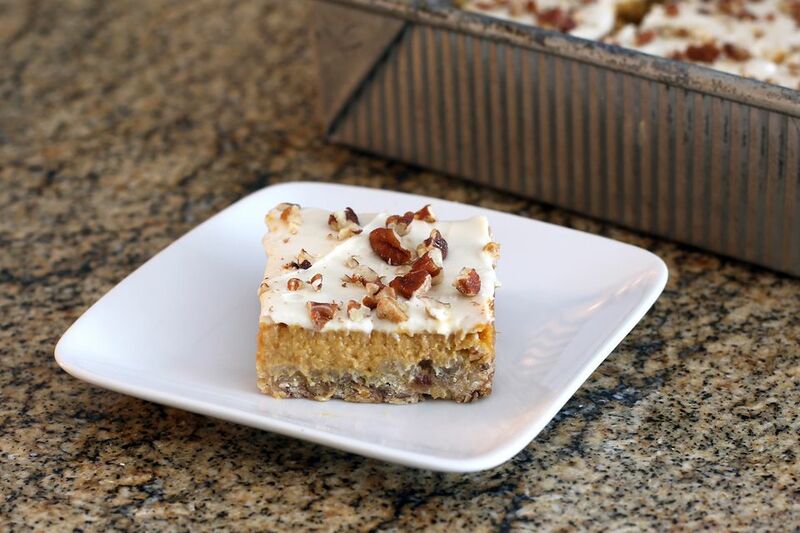 These pumpkin pecan bars are made with three layers: a pecan and oat shortbread crust, a creamy pumpkin custard filling, and a simple sweetened cream cheese frosting. Sprinkle with chopped pecans or place one or two pecan halves on each bar. If you prefer walnuts, substitute walnuts for the pecans, or use chopped hazelnuts. Combine the cookie crust ingredients; press into the prepared baking pan. Bake crust in the preheated oven for 10 minutes; place on a wire rack to cool completely. Combine filling ingredients; mix well. Pour over the cooled cookie base; bake in the preheated oven for about 35 to 40 minutes, or until the filling has set. Transfer to wire rack to cool completely. Beat the cream cheese at medium speed until smooth and creamy. Sift confectioners' sugar over cream cheese; add the 2 teaspoons of vanilla and beat until smooth. Spread the cream cheese topping over the cooled filling. Cut into 12 to 16 bars and decorate with pecan halves.